Bloomberg published a report Friday afternoon based on leaks by a source with intimate knowledge of the Mueller probe (and Mueller’s thinking on the probe) who said Special Counsel Robert Mueller has not cleared President Donald Trump of colluding with Russia in the 2016 election nor of obstructing the subsequent investigations into the alleged collusion. The leaker also claimed Friday’s indictments about Russian interference in the election are meant to be a warning for the 2018 mid-term elections. Special Counsel Robert Mueller and his prosecutors haven’t concluded their investigation into whether President Donald Trump or any of his associates helped Russia interfere in the 2016 election, according to a person with knowledge of the probe. Friday’s indictment of a St. Petersburg-based “troll farm” and 13 Russian nationals should be seen as a limited slice of a comprehensive investigation, the person said. 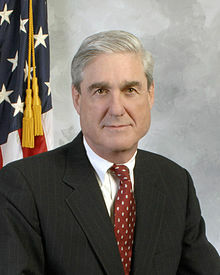 Mueller’s work is expected to continue for months and also includes examining potential obstruction of justice by Trump, said the person, who requested anonymity to discuss an investigation that is largely confidential. …“Russia started their anti-US campaign in 2014, long before I announced that I would run for President. The results of the election were not impacted. The Trump campaign did nothing wrong – no collusion!” Trump said on Twitter. That has yet to be determined. Friday’s indictment should be seen as an effort by Mueller to raise awareness about Russia’s capabilities as the 2018 U.S. elections draw near, the person said. It’s still possible that Mueller will indict Americans for knowingly helping Russia, the person said. End excerpt. Please read the entire Bloomberg article at this link. Earlier today, Deputy Attorney General Rod Rosenstein announced indictments against 13 Russian nationals and 3 Russian entities for meddling in the 2016 Presidential election, which began in 2014 before the President declared his candidacy. President Donald J. Trump has been fully briefed on this matter and is glad to see the Special Counsel’s investigation further indicates—that there was NO COLLUSION between the Trump campaign and Russia and that the outcome of the election was not changed or affected. The Justice Department issued a statement about the indictments–the conclusion of the statement was apparently rebutted with the leak to Bloomberg. …There is no allegation in the indictment that any American was a knowing participant in the alleged unlawful activity. There is no allegation in the indictment that the charged conduct altered the outcome of the 2016 election.